CS101 is a high performance handheld reader with the most rugged construction and maximum functionality at the lowest total cost of ownership. 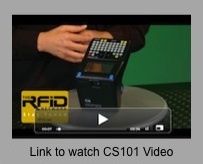 The CS101 Handheld Reader is a top selling handheld reader in the RFID market. The CS101 Handheld Reader has a high reputation for providing the longest read range for a UHF C1G2 mobile reader. The combined high read range performance with the 1D/2D barcode reader, intuitive software development kit, touch screen and full keyboard has made the CS101 a favorite for industrial, warehouse, and IT asset tracking. “We utilize the CS101 for several oil and gas clients because the CS101 can handle harsh outdoor conditions and rough handling.” Sujatha Bodapati, Founder and CEO of AssetPulse. “In our experience, the CS101 consistently reads twice as far as the Motorola 9090 at half the price of the 9090. We recommend the CS101 to all our hospitality and garment tracking customers.” Neal Jordan, VP Operations, Foundation Logic Systems. “CS101 Handheld RFID Reader is used in RFID4U training courses due to its high performance, easy of use, and programming customization flexibility.” Sanjiv Dua, RFID4U CEO. We wanted to share the news of Convergence Systems Limited, CSL-RFID, partnership with North American distributor, TransTech Systems, Inc. We are excited to work with TransTech Systems to support our partners and customers in the North American market because they are a leader in identification products and focus on providing excellent customer support, delivery times, and service to system integrators and vars. TransTech Systems also provides weekly RFID Q&A insights on their blog at assettrackit.com.